The automotive world seems transfixed with two areas of progression these days: ultra-low emissions and autonomous cars. The latter is an issue that leads to many questions, yet so many manufacturers seem intent in pushing forward with new technology to make it happen. Audi is one such firm attempting make its advances in the direction of driverless cars and had some of the motoring press try out one of the company’s new RS7, but no ordinary RS7; one which had been fitted with state-of-the-art tech that will enable it to drive itself on the motorway and park up on its own. 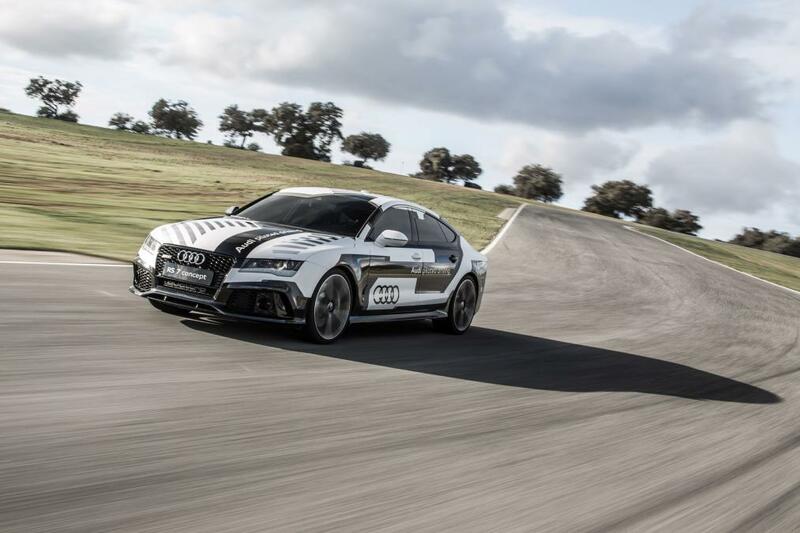 This won’t actually be happening any time soon, but Audi has been testing its special RS7 around the tricky Ascari circuit in Spain and pitting it against an standard version to see how it copes against human opponents. An example of this saw Auto Express tackle the circuit in a reasonable 2min 12.5sec to lay down a benchmark for the autonomous version. Audi nicknamed the driverless RS7 ‘Bobby’ and the car looks exactly like the normal car, besides the addition of a covered switch that looks like it’ll launch a missile than anything else and a thumb-operated plunger that works as a safety device in the event of a hitch. In autonomous mode, the RS7 turns itself on, waggles the steering wheel as part of a systems start-up check and then gets on its way, using all of its 560bhp in the process. ‘Bobby’ then proceeds to brake, steer and accelerate accordingly through the windy track, hitting every apex on the way and correcting the steering if any opposite lock was required. 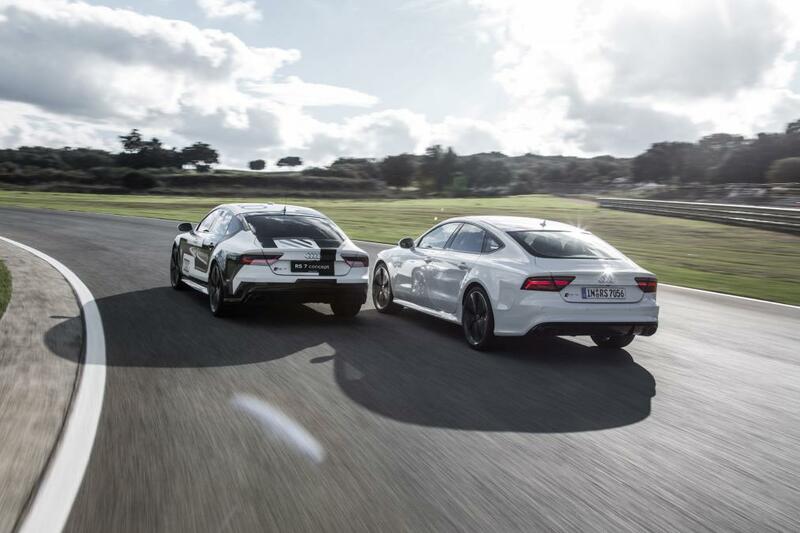 Crossing the line, the driverless RS7 finished the lap in 2min 14.6sec – just 2.1sec slower than the human-operated Audi. However, to beat the time set by the organic driver isn’t the point of this technology, but is instead to offer a driver the option of the car taking the reins on a particularly boring commute or help out when driving gets a bit tough or tiresome. ‘Bobby’ introduces the kind of systems Audi wants to put within future models in its range, albeit in a gradual manner, with an extension if its city safe automatic braking system arriving next year and also the firm’s ESP systems will be supplemented by mild assistive counter steering to help prevent spins. Before 2020, Audi is looking to roll out its autonomous technology on its models to allow drivers to take a back seat in a manner of speaking while the car drives a monotonous motorway journey by itself. However, this is where the issue of driverless cars comes to a halt, as before any of this technology is physically inside these vehicles, the Vienna Convention needs to alter its current stance. Right now, the convention states that “the driver must steer his car” and is something that all European countries are currently signed up to; this would obviously need to change in order for such technology to exist within the open market. With so many manufacturers developing autonomous systems for current or future models, it feels almost inevitable that something will change and that we will indeed one day see driverless cars on our roads, but whether that will happen sooner rather than later will come down the people it’s aimed at: the consumer. The issue has been discussed many times in recent years, and it seems there is a definite split in those would welcome it and those who would dismiss it; one thing that may further the divide is price, as no one really knows yet just how much this will all cost those it is being developed for. There are still a few years of further advances and tests to be completed in autonomous technology, and until they are completed, we will just have to watch and wait.